Internet Marketing Tools You Can Use! Resources below are some of our favorite Internet marketing tools for launching and maintaining a successful Internet Marketing campaign. Please note that we may receive a nominal commission should you click on any of the links below and make a purchase (see our full Affiliate Disclaimer here). As business owners and executives, we are always looking for ways to clone ourselves… unfortunately biologically, it is illegal. Well, here’s the next best thing… Infusionsoft! Build your list and get more leads converted! 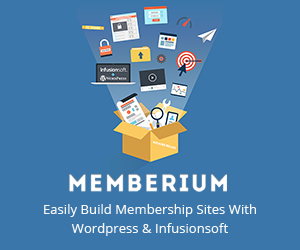 Build membership sites with WordPress and Infusionsoft with this awesome plugin! Looking for an excellent starting ground to host you website? Bluehost is a “GOOD” choice… Inexpensive and reliable! Ready to step up your game? Overall, SiteGround gives the best bang-for-the-buck when it comes to speed, reliability and support! If you are looking for a high-end, solid performing web host best suited for WordPress sites… try WPEngine. Protect your website investment from the BAD people… and yes there are bad people looking for sites like yours to attack and hack. Sucuri offers very inexpensive real-time monitoring and repair of your website should you get hacked. Make your life easier by starting your website with a well developed and sharp looking website theme or template! Need the ability to accept credit cards online? PayPal offers a fast, affordable and convenient online payment service for businesses of all sizes! Looking for a simple to use and inexpensive email marketing solution? Here are some of our favorite tools to get you going (choose 1)! Need a new logo for your business? Here’s a great way to pit numerous designers against one another for the price of one… may the best logo designer win! Need royalty-free images for your website, newsletter, or other marketing pieces? Photodune is a great resource to make your marketing pop! Online Marketing Muscle® is a marketing automation agency that helps small business owners gain leverage on their business.